The OSU laboratory safety coat program is being sponsored by EH&S and provides laboratory safety coats for all OSU laboratory employees at no charge to the department. 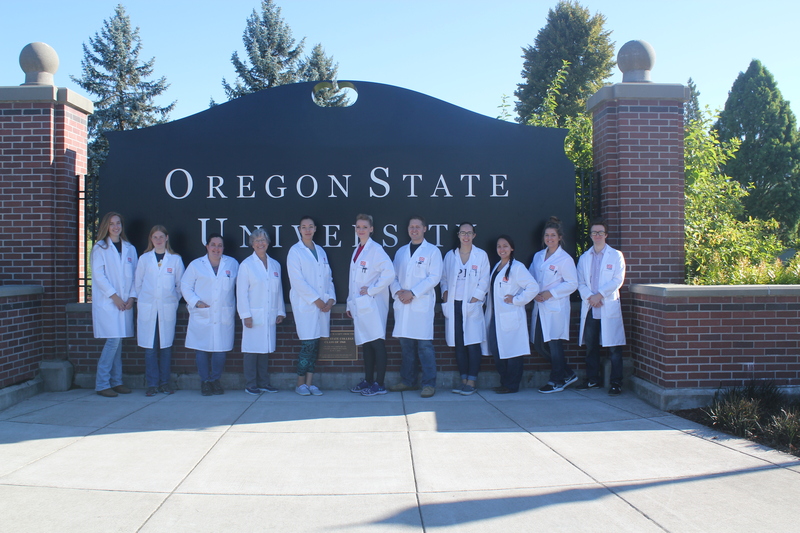 Pictured below is Dr. Morrie Craig’s laboratory staff with their new lab coats. Laboratory coat delivery and laundry services are being provided by CINTAS Inc. CINTAS can visit your lab space to provide fitting and sizing for your department. Alternatively, for smaller groups or for individuals, a sign-up form can also be submitted directly to CINTAS. Once ordered, lab coats are typically delivered within 4 weeks. To help control costs, please use the form to remove any employees who have left the university or no longer work within your laboratory. Oregon State University is committed to providing a safe and healthy working environment for the University community. It is University policy to comply with all applicable health, safety and environmental protection laws, regulations and requirements. The Occupational Safety and Health Administration (OSHA) ensures workplace safety through the enforcement of established federal legislation, and the Oregon Occupational Safety and Health Administration (OR-OSHA) operates as the acting state regulatory enforcement body under the direction of the OSHA act. Additionally, current federal biological safety guidelines and/or regulations from the Centers for Disease Control and Prevention, the Animal and Plant Health Inspection Service and the National Institutes of Health require the use of PPE in laboratories designated as biosafety level (BSL) 1 or higher and when working with research animals, based on a risk assessment process.